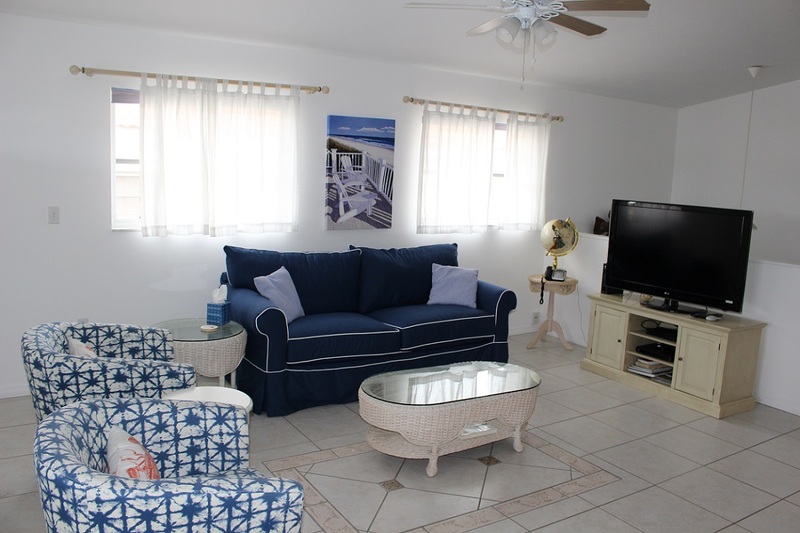 This charming vacation rental home has 3 bedrooms and 3 baths. This duplex is located in the prestigious city of Key Colony Beach, Florida Keys. It overlooks a wide canal with 30 ft of dockage. This home is within walking distance of the Cabana Club which features a private beach, private pool, and spa. Bikes (4 adults) and a double kayak also come with the rental. This home has a light and Keyzee decor, and an open concept floor plan. Included are high-speed internet and cable television. The main area has a fully equipped kitchen and a living area with a flat-screen TV. The dining area has a beautiful wood dining room set that seats six. You may view the boats going by while enjoying your meal. The master bedroom has a king size bed and flat screen TV and an adjoining bath with a jetted tub/shower. The guest bedroom has a queen size bed and guest bath across the hall with a tub/shower. The laundry room with full-size washer and dryer are also on the main level. The downstairs area has a private sitting/dining area, and bedroom with king size bed and a full bath. There is also a trundle bed with two twin mattresses. The home is just around the corner from Key Colony Golf Course and Tennis Courts. With all the amenities you could want, you are sure to enjoy this beautiful Key Colony Beach home! The Island of Marathon is a bird watcher’s paradise – spot roseate spoonbills, bald eagles, great blue herons and much more native to the region. The Marathon Wild Bird Center is located at Crane Point Hammock, a hardwood hammock and natural history museum.